Technology connects us in powerful and unpredictable ways. Much of this activity, while so central to our lives, is invisible to the eye and thus easy to ignore. Khan Lee’s analytical yet airy exhibition Wings of Desire at Republic Gallery plays with the aesthetics of technological frequencies and the attention (or the lack thereof) given to them. 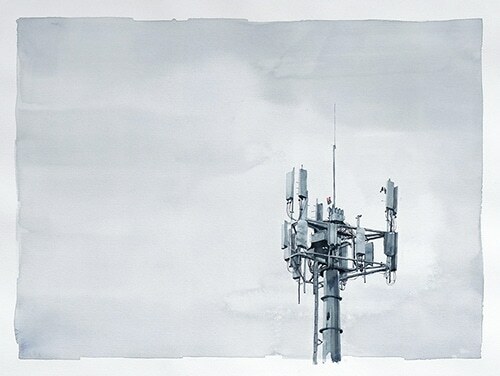 The idea for the exhibition grew from the artist’s ongoing interest in cell towers. They are common to a city’s landscape yet often go unnoticed. Lee is an experimenter. “I need to suffer,” he explains in describing his process of working with unforgiving materials. The exhibition looks, aesthetically speaking, very different from his usual colourful sculptures made from everyday objects. What makes this distinctly Lee is his penchant for setting up elaborate propositions that he is forced to figure out without constraint to a particular medium. This process is evident in his subtle watercolour work. His exhibition is an experiment with a set of parameters that facilitates an investigation into ways of seeing what is right in front of us but not visible to the eye. Along one wall of the gallery is a suite of cell tower paintings. Nearby is a set of six white cast hands posed as if taking selfies with an invisible smartphone. In place of a plinth, the hands are propped up on a window ledge. Their appearance echoes the ubiquitous gesture of someone documenting their gallery visit. Lee has also cleverly orchestrated a DIY signal receiver: two pizza pans hang vertically in the front window picking up a cacophony of signals. A computer monitor displays the real-time activity of these frequencies. 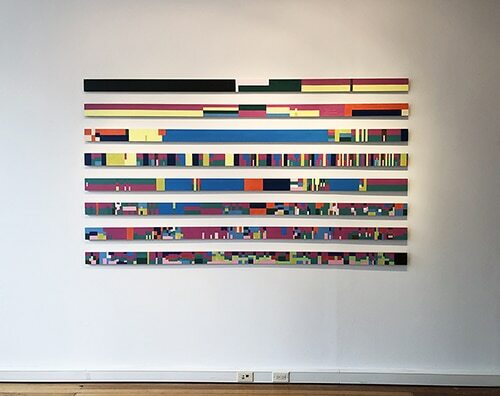 A large-scale painting on panel strips shows Canada’s radio spectrum allocations marked out in blocks of pigment. The result is an elaborate colour-coded graph made with paints left over from a colour theory course Lee took in art school. This is his first oil painting project. The final piece in the exhibition is 430THz. A solitary bulb fills an empty corner of the room with light. Its frequency is the lowest detectable to the human eye. End note: Bruno Ganz, the actor who played the angel who chose to become human in the film Wings of Desire passed away on February 15, the day after the opening reception of Lee’s exhibition and the first full day the show was open to the public. Khan Lee: Wings of Desire continues until March 23.